Xavier Musketeers center Matt Stainbrook has been named Big East Player of the Week. 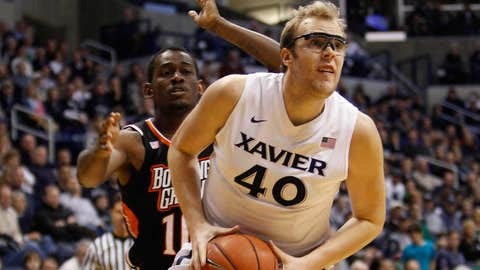 CINCINNATI — Xavier University junior Matt Stainbrook has been named Big East Conference Player of the Week. Stainbrook posted game highs of 21 points and 10 rebounds in Xavier’s 68-53 win over Wake Forest on Saturday. Stainbrook shot 9-of-12 from the floor on his way to those 21 points, which also set a new Xavier career high. For the season, Stainbrook is second on the team in scoring at 11.2 ppg. and first in rebounding at 8.5 rpg., which ranks third in the BIG EAST Conference. Xavier, 10-3, hosts St. John’s on Tuesday at noon in XU’s first-ever Big East Conference game, which will be broadcast nationally on FOX Sports 1.